A new story of the living Earth. Experience Earth history like never before with the award-winning Deep Time Walk. 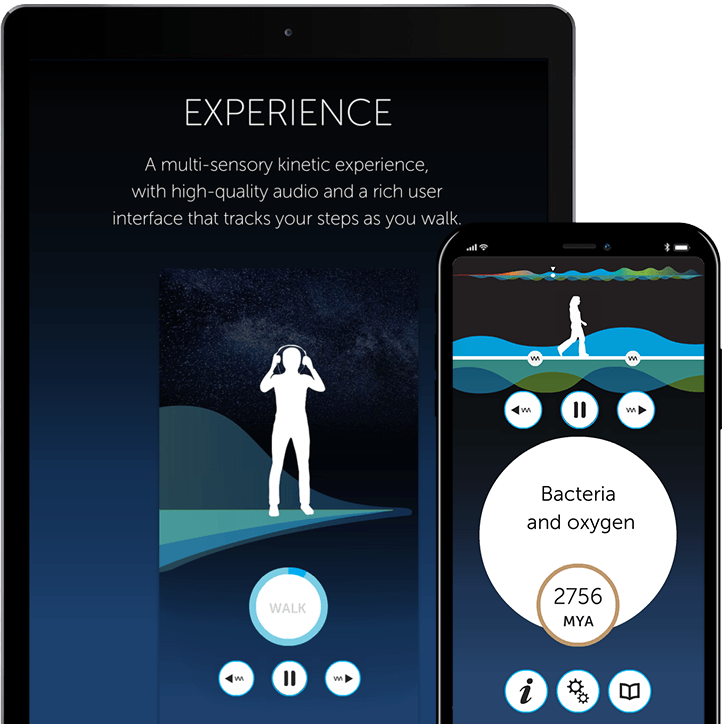 Designed using appropriate technology by an experienced team of experts, the Deep Time Walk calculates your speed and distance as you journey through time, enabling you to learn about key evolutionary events as they occur across Earth’s 4.6bn year history and explore the geological impact of humans in the age of the Anthropocene. Walk a narrated history of our Earth. The dramatised Deep Time Walk can be experienced anywhere in the world. Walk 4.6km through 4.6bn years of Earth history, learn about key concepts from Earth’s evolution and experience a unique perspective of deep time. A transformative experience for iOS and Android. Designed by an experienced team of radio producers, professional actors, award-winning script writers and sprinkled with creative genius, the Deep Time Walk brings together excellence in science, the arts and appropriate technology to provide a unique experience of Earth history. New version adds innovative features; Gaiaphonic Audio, Clock-time Remaining Indicator, swipe and slide UI gestures and the integration of 'What's Next' portal for positive action (with organisations such as Earth Charter, 350.org and Transition Towns). Partnership with Earth Charter International encourages walkers to sign Earth Charter and download Mapting. As a small social enterprise we have been supported by two successful crowdfunding rounds, the last being match-funded by the Heritage Lottery Fund. We are currently growing our partnership base to help foster wider understanding of deep time and to show humanity’s deep ancestral history and interconnectedness with all life.